Plot location was chosen based on dominate vegetation type (T or W). The tussock tundra plots are located near the Moist Acidic Tundra plots characterized by Shaver and Chapin (1991). The wet sedge plots are located near the outlet of Toolik Lake; all plots have been used by the Arctic LTER project at Toolik Lake. Using soil sampling needles and a 60 mL syringe, we pulled 40 mL of bubble-free water out of the ground. We then pulled 20 mL of ambient air and vigorously shook the syringe for 2-3 minutes. After the shaking period, the gases in the headspace should be in equilibrium with the dissolved gas content. We transfered ~10-15 mL of the headspace air into a nylong, airtight syringe. 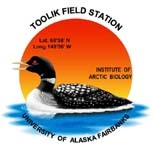 The syringes were returned to the laboratory at the Toolik Field Station and were ran on a Shimadzu model 14A gas chromatograph with a thermal conductivity detector (TCD) and a flame ionization detector (FID) to determine CO2 and CH4 gas pressure, respectively. The sample chromatogram peak area was converted to concentration based on a standard curve (Kling et al. 2000). Using soil sampling needles and a 60 mL syringe, we pulled 20 mL of bubble-free water out of the ground. The water was transferred into a 20 mL serum bottles capped with aluminum capped teflon septa. We added 0.2 mL of Mercuric Chloride to preserve the sample. Samples were returned to the University of Michigan, the samples were acidified to convert all inorganic carbon to carbon dioxide, and the dissolved carbon dioxide was ran on a Shimadzu model 14A gas chromatograph using a TCD detector (Stainton 1973). Kling, G. W., G. W. Kipphut, M. M. Miller, and W. J. O'Brien. 2000. Integration of lakes and streams in a landscape perspective: The importance of material processing on spatial patterns and temporal coherence. Freshwater Biol. (43): 477–497. Shaver, G.R., and F.S. Chapin. 1991. Production - biomass relationships and elemental cycling in contrasting arctic vegetation types. Ecological Monographs 61(1): 1-31. Stainton, M.P. 1973. A syringe gas-stripping procedure for gas-chromatographic determination of dissolved inorganic carbon and organic carbon in fresh water and carbonates in sediments. J. Fish Res. Bd. Canada 30:1441-1445.